Jenna over at Speech Room News and Jenn over at Crazy Speech World invited all of their followers to play a little #InstaSLP game on instagram over the next two weeks. This prompted me to take more pictures than usual in therapy today. As I have mentioned in my profile info, I work in the best of BOTH worlds. Three days a week, my days are spent in a long term care and skilled nursing facility. Since Mondays are blah, I decided today would be “Magnificent Monday!” After stopping at the dollar store and picking up some paint, I rushed on into work to get everyone started. Each person who came in today got to make at least one leaf. I work in the Occupational Therapy gym so we love to co-treat. 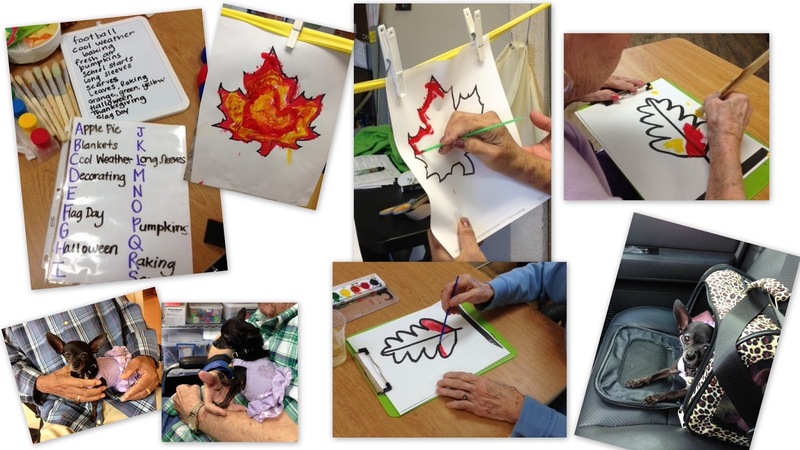 Some of our patients who are working on endurance and ADLs specifically reaching up and performing tasks from wheelchair level had the challenge of painting their leaves while they were suspended in mid air. Others who need a less challenging approach, worked from the table top. My speech focus today? Attention to task, memory of task, following directions, problem solving, thought organization, categorization, expressive language, orientation and reminisce. It was a great day as we talked about the sights and smells, sounds of fall. We talked about their own children and how they went back to school each fall. Football, baking, raking leaves, sweaters, pumpkins and apple pie were all among our conversation topics today. Of course Lisa Marie was there and provided enough puppy love for everyone who wanted to hold her OR those who wanted to leave and we bribed to stay. She works wonders for our patients with dementia. Before you go, visit this affiliate link! I love your blog! Its a pleasure being a part of your team! …providing skilled services yet engaging our patients in leisure activities! Everyday is an adventure… can't wait till our next task! !